OurLight Magnesium Carbonate is a Industrial Product, which is mainly used in preparing Antacid Preparations, Talcum/Face Powder, Rubber, Glass, etc. Based on its applicability in various industrial applications, we have claimed a topnotch position in the nationwide markets. 1,Liangjiang brand – light magnesium carbonate, also called basic magnesium carbonate. Appearance is white monoclinic crystal or amorphous powder. Non-toxic, tasteless, and stable in air. Density ratio is 2.16. slightly soluble in water, aqueous solution present alkalescence. Solubility in water is 0.02%(15℃). Easily soluble in acid and ammonium salt. 2,Liangjiang brand – light grade magnesium carbonate, mainly used as medical intermediate, antacid, color fixative, carrier, anticaking agent; food filler, magnesium compensator; also can be used as filler and fortifier for rubber products, heat resisting fireproofing material. It is widely used in many industries, electric wire, magnesium salt, pigments, paints, daily cosmetics, shipbuilding, boiler producing, sports etc. Manufacture process of MgCO3, is different based on different route of raw materials. The process is divided into 4 kinds, brine carbonization method, magnesite carbonate method, Asbestos tailings carbonization method, bicarbonate method. This method takes brine, seawater and other magnesium chloride solution, magnesium sulfate solution as materials, calcined with dolomite or limestone to produce CO2, dolomite lime or lime, and then digesting, carbonization, pyrolysis to get light grade magnesium carbonate. The process of getting magnesium compound in this method is same as dolomite carbonation. Because of lower Calcium content in magnesite, it needn’t set recycle system of CaCO3 which contains magnesium, and also lower calcium content in finished product magnesium carbonate, so quality is better, cost is lower, more competitive. It is a new technology, need to be paid more attention by factories. According to different applications of magnesium carbonate, it can be divided into industry grade MgCO3, food grade MgCO3, medical grade MgCO3, transparent MgCO3, electrical grade MgCO3, bulk MgCO3 and aciculiform MgCO3 etc. 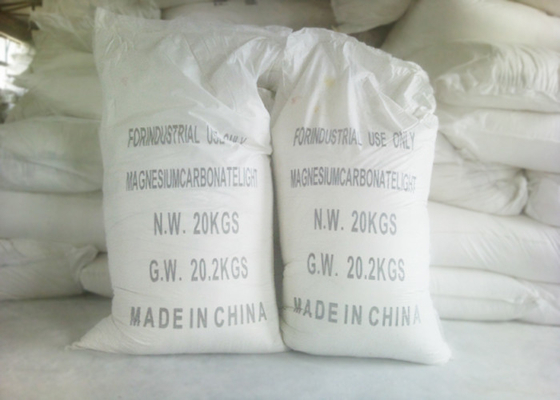 Light magnesium carbonate is widely used in many fields. In pigments, paints and printing ink industries, MgCO3 can be used to produce high purity magnesium compound. MgCO3 also be used in fireproofing, extinguishant, floor and insulating material industries. In plastic and rubber industries, MgCO3 is used as filler and smoke inhibitor. In addition, in glass, ceramics and chemical medicine producing, MgCO3 also can be used in little. CPU grade MgCO3 can be used as salt additive, antacid in toothpaste and biscuits. Application: mainly used as filler and fortifier in transparent or light-colored rubber products.